What most federal grants and subgrants pay for more than anything else is people — human resources. So, the intersection between standard personnel administrative practices and federal grant requirements is a critical one for those managing the human resources policies in federally funded organizations. At a minimum, you need a working knowledge of the federal requirements for allowable expenses affecting employees and independent contractors. And, as the likely “knowledge manager” for your organization, you need to figure out who else needs to be trained up on the federal grant rules so that colleagues can avoid potentially costly missteps. Now is a good time to gain this understanding. That is because we are still in the early stages of implementation of a reformed and repackaged set of grants management policies crafted by the Office of Management and Budget. The rules apply uniformly to all governmental units, higher education institutions and nonprofit organizations that receive grants directly from the federal government and indirectly through other organizations. 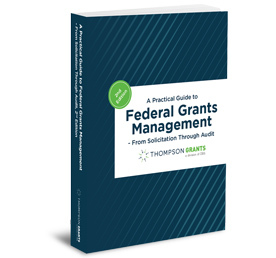 Join Bob Lloyd, principal of Federal Fund Management Advisor™, for this thorough review of a key federal grants management responsibility.